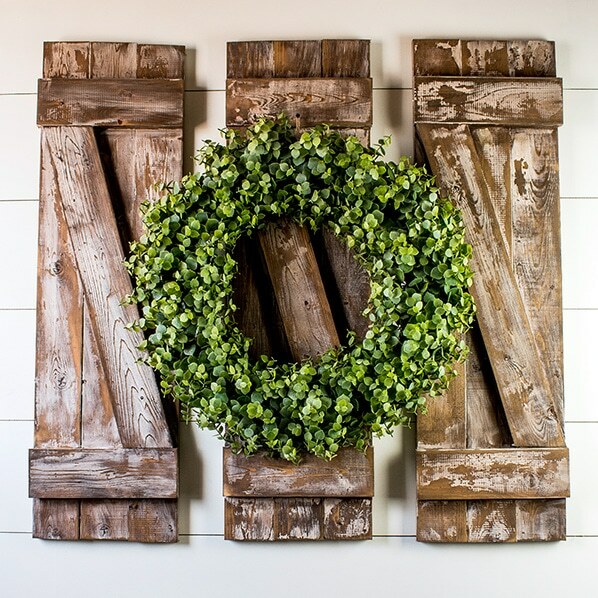 These rustic shutters were so easy to make. I had them cut in a matter of minutes and gluing them together was a breeze. Anyone could make them! They only took a few cheap 1×4’s and some stain, and they were ready to go. I built them for our dining nook. Is that a thing? Kitchen nook + dining room =’s dining nook? Sure, why not right? We recently finished renovating our dining area (er..nook). The space is super small, so small that I could not fit my farmhouse table in the middle of the room and have my chairs pull out or not hit a closet door. I couldn’t part with the table because it’s one of the first projects that my husband built for us and I adore it. The only way we could make the table work in that room was to push it against the wall and create a nook. The nook bench was custom made by yours truly. It’s a testament to how even with the smallest bit of woodworking skill you can put together a custom solution for your home. Never mind the fact that I had to pull apart that bench and start over not once but twice. As the dining room was near completion, I was irritated by this giant blank wall that we created. 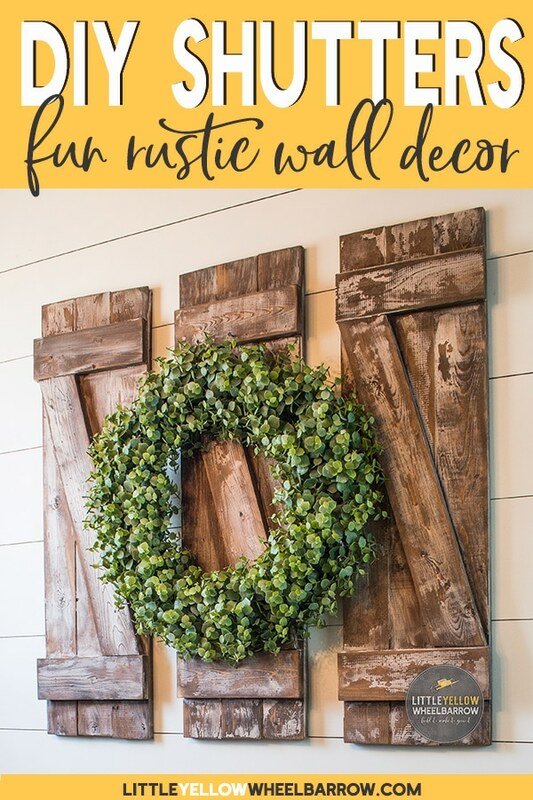 I looked high and low for rustic wall decor that would work, and I couldn’t find anything that I liked. If you’ve read any other snippets on this blog, you will find that this has become a running theme. The perfect “thing” exists in my head but I can never source it, so my solution is always to build it, or make it, or have my husband create it. We created a Room Planner you can download for free! 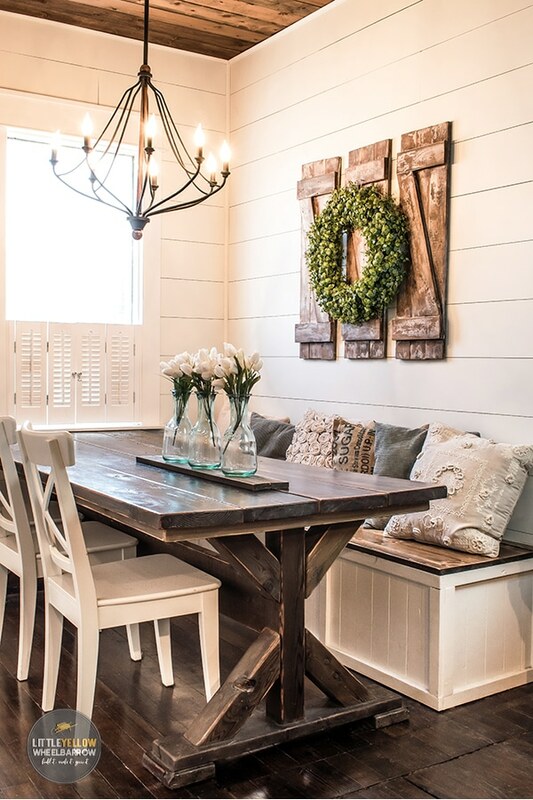 If you want to plan rooms like the dining nook, I shared my process so you can do the same. 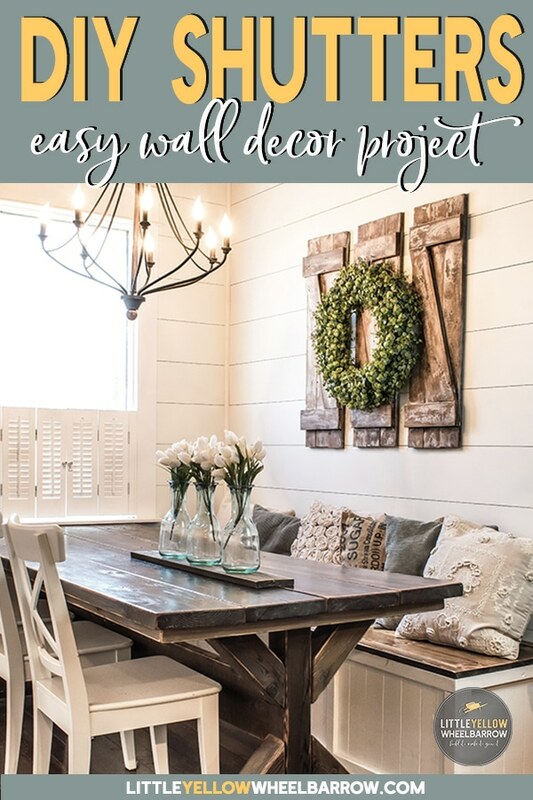 The great thing about these rustic shutters is you can make them as small or as large as you want. These are 36 inches high, and 36 inches wide spaced with two inches in-between. I had to make mine over a few days because we only have one set of clamps. We really need to up our clamp game! Maybe I will buy the husband a few sets of clamps for Christmas this year. We can name them all Homer. (I hope someone got that joke). Moving right along…ahem. You can make all 3 of these rustic shutters for about $30.00 (CDN). 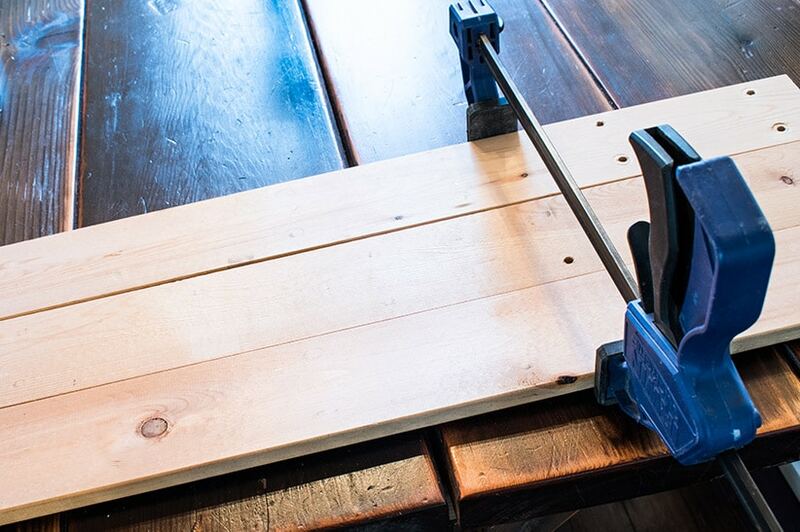 Cheap and easy – just the way I like all my DIY projects. For me, the DIY shutters were beyond cheap because they wound up being free. I dug through our scrap wood pile and found a few 1×4’s that we had for another project that we didn’t use. So this project cost me nothing, except the cost of that beautiful eucalyptus wreath. The wreath is artificial, so no smell. Perfect for the dining nook. 7 1 inch x 4-inch x8 feet pine lumber. , it’s the only glue I use. Line up 3 36 inch 1×4’s and add glue to the inside edges of the boards. Be sure to add the bead of glue all the way down from top to bottom. Once your two inside board edges have glue, you are going to clamp them together. 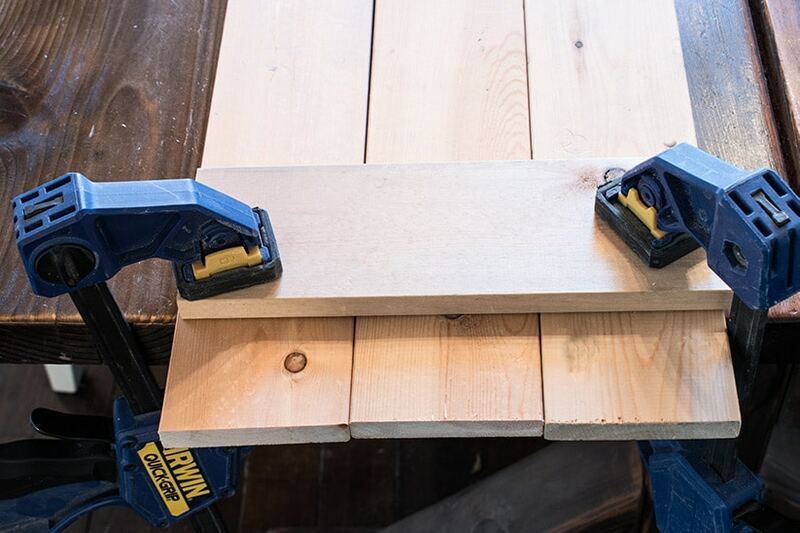 Let your glue dry for at least an hour before removing the clamps. Add the 10.75-inch board horizontally across the top. Place this board 3 inches from the top. Add a double bead of glue under the horizontal piece and clamp in place. Add the bottom piece the same way and clamp place. Now, this is the step where professional woodworkers would give you instructions to cut the piece at a specific angle on your miter saw. Good thing I am an amateur because I am going to tell you how I skipped the angle lesson and still got a perfect fit. My solution to getting the inside slanted shutter piece cut correctly is to mark a line and then cut my board based on the line I marked. It ends up perfect every time, and I don’t have to fuss around with geometry formulas. Adulting is hard enough, don’t make me do math too. Here is a diagram because honestly, it explains it far better than I ever could. 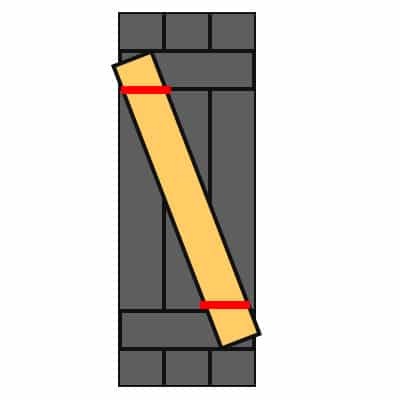 Lay one 27in (or longer) 1×4 diagonally across your shutters as shown. Using a straight edge, draw a line across the board where it will need to be cut to fit inside the top and bottom horizontal pieces. The line will need to be just inside the frame, along with the edge of the 1×4. Do this at both ends, and cut the board just inside those lines. Test fit the board before resetting the angle on your saw! Once your piece is cut you are going to slide it into place and glue it the same we did the bottom and the top. Let your glue dry overnight. Step four is an optional step. If you clamped and glued your wood pieces well enough, you shouldn’t need to add the finishing nails. I like to err on the safe side, and I always add the extra step to make sure my build stays together. Flip your decorative shutters over and add small finishing nails through the back boards into the front pieces. These finishing nails add an extra layer of stability. You can also use a hammer and a few very small finishing nails instead of a nail gun. Repeat steps 1-4 to build the rest of your decorative shutters. You can choose to refinish your decorative shutters anyway you want. 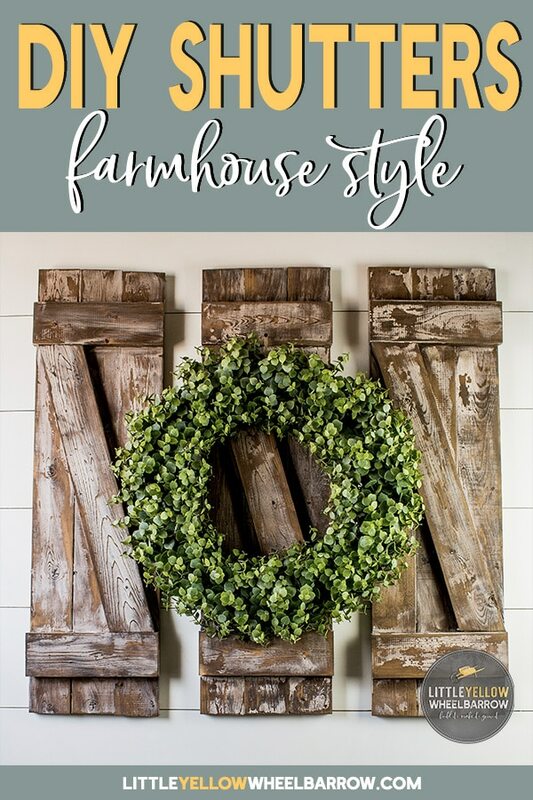 I wanted to paint mine a funky color, but funky colors do not work well in my all neural wood and white farmhouse, so I stayed safe and stained them and roughed them up to create a rustic finish. If you like the finish that I used you can check out THIS POST. 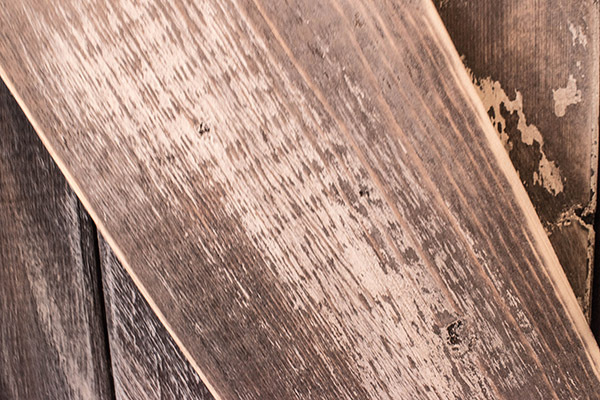 It will take you to our DIY headboard tutorial, and if you scroll down to the bottom, you will find the detailed instructions for that chippy, worn wood look. A very cheap way to fill a blank wall space! These shutters are an easy and inexpensive project to build. The only thing that takes time is the gluing and clamping. I took a few days to make these just because I had to wait for the glue to set! I also had to wait for a day for my stain to dry. 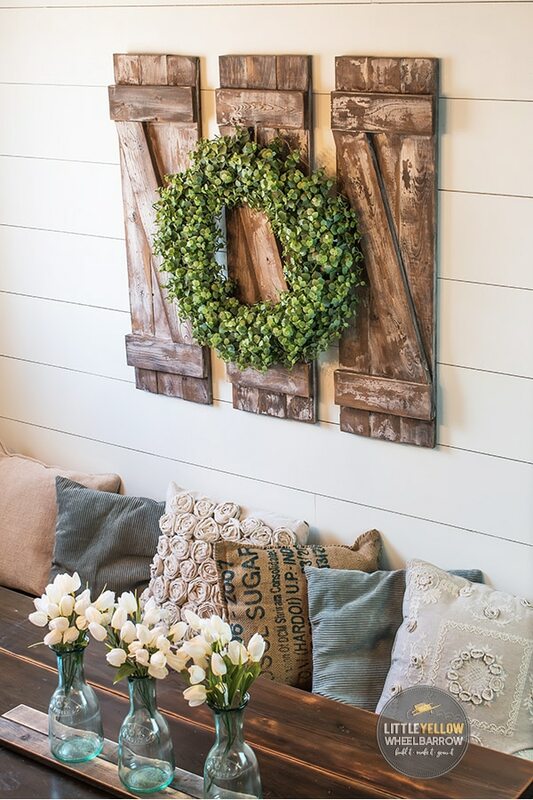 These rustic shutters would make an adorable Christmas farmhouse wall decor item as well. I can see them with a Christmas wreath, or even used as Christmas card holders. I think there are all kinds of fun things you could do with them. If you do decide to make them, or if you have some fun ideas for them let me know in the comments! UPDATE: I had to add an update to this post because I have been receiving lots of questions about our dining nook. The color on the wall is Sherwin Williams Alabaster. The light fixture was purchased from Lowes. The table was designed and built by my husband. We used a vinegar and steel wool stain solution on the table. The nook bench was designed and built by me. The chairs are simple inexpensive Ikea chairs. I am still hunting auctions and vintage shops for the perfect Windsor chairs of my dreams. If you have any other questions, feel free to drop me a line. I love the whole look but I really like your pillows, where did they come from? Hi Melinda, thanks for the comment! The pillow on the far right, the one that looks like it has tiny flowers and embroidery appliques all over it (it’s the beige pillow) I purchased from Winners. I spent a good year checking back to see if I could find a match with no luck. The rest of those pillows I made myself from fabric I had laying around. The rose pillow was made from a drop cloth. I actually have a tutorial here for that pillow https://www.littleyellowwheelbarrow.com/diy-beautiful-rose-textured-pillow/. Do you have a How-to for the bench?! You’re not the first person to ask about that Jamee! The table and bench were customized to fit that room, so they are not at all standard sizes. The bench might not look it in the picture, but it is 88 inches long making it too long for most tables and too short for the rest. So I am guessing that any plans that I did pull together wouldn’t work for most people due to the awkward sizing. How deep did you make the bench? Hi Amy, my bench is 21 inches deep but honestly, it would have been far more comfortable with a few extra inches. We just didn’t have space in that room to make the bench any deeper. Cheers! Where did you get that table? Amazing! Believe it or not but that table is a total DIY! My husband designed it and made it for me. He’s a keeper. The total cost of that table was about $250 (CDN). The table is made from untreated cedar and if it was made from pine it would be even cheaper. I am all about getting that “look” and not spending a fortune in the process. Thanks for the comment, Susan! Where did you get your dining light fixture? I’m in love!! Hi Hailey, I purchased that light from Lowes Canada. It’s still available on the Canadian site. If you are in the US, Lowes doesn’t seem to have it listed anymore, but there is one that is very similar from the same line, it very well might be this year’s model. The light is Kichler Lighting Carlotta 8-Light Distressed Black Wood Hardwired Standard Chandelier. Cheers!